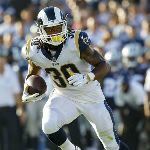 The Los Angeles Rams are looking to take down of a New England Patriots team making its third straight trip to the Super Bowl, but to do that they’ll need to have a healthy and fully recovered Todd Gurley. Gurley, who dealt with knee issues the week of the NFC championship, is looking to be back at full strength by kickoff. Even though Gurley was pain-free against the New Orleans Saints, Rams head coach Sean McVay decided to use fullback C.J Anderson in the starting role as he considered that at the time, he was the best option offensively. On Friday Gurley said to ProFootballTalk that his knee is fine, while on Saturday, Patriots linebacker Dont’a Hightower said to the Boston Herald that he expects to see a lot of the Rams back in the Super Bowl. “I don’t give a damn what I do (in the game), honestly. I just want to win, so I don’t really care. You always want to do good, but you just want to win” Gurley said. It’s obvious that Gurley is a key component of the Rams’ offense and they will need him to beat the Patriots. He was very productive in the divisional round against the Dallas Cowboys as he averaged 7.2 yards per carry, and he’s a back that during the regular season finished with over 250 carries and an average of 4.9 yards per attempt. In the Super Bowl, the Rams running game has to work in order for their play-action game to be effective. The Rams have to be determined to stick to their gameplan and commit to the ground attack even if it doesn’t work early. The commitment is vital because once Gurley gets in a rhythm, he becomes the catalyst for their offense, which opens a lot of other options for quarterback Jared Goff and the Rams’ play-action game. Thus, the Rams will look to give him a heavy role against New England as he’s just too explosive and hard to stop when he gets rolling. Of course, the Rams offensive line, which is one of the best in the league, needs to dominate the Patriots defensive front and win the battle in the trenches to open lanes and holes that will allow the Rams backs to get to the secondary. If this unit continues to excel, Gurley and the rest of the Rams ground attack will lead the Rams to victory.